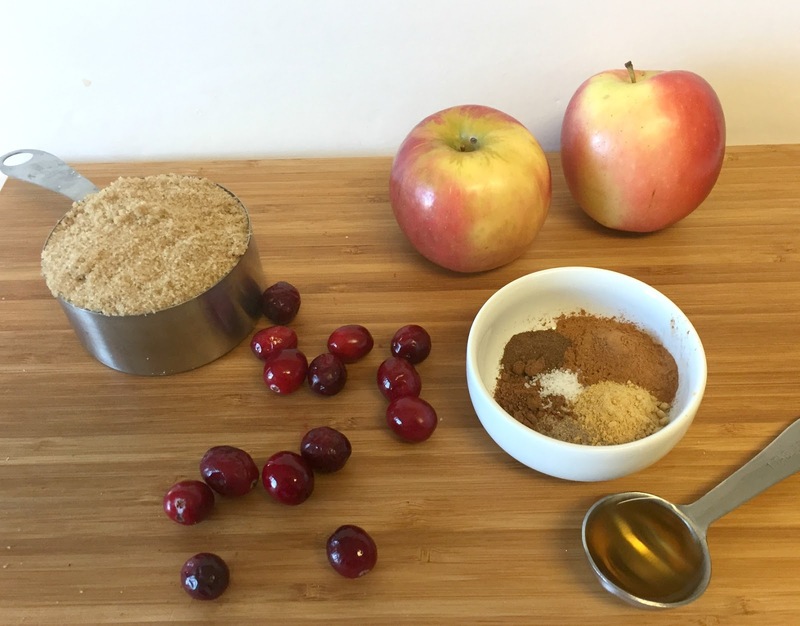 For years I have made my pear honey cranberry sauce on Thanksgiving. 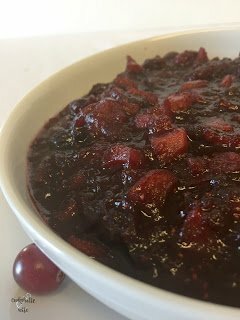 I chose the recipe because of the addition of pears and honey helped to tame the tartness of the cranberry sauce and my family is not a fan of tart cranberry sauce. I’ve always been a fan of bold flavors. If your food doesn’t have flavor, what fun is there in eating it? Which is why I tend to push the limits on how much flavoring you can add to a recipe before it becomes too much. Sometimes I end up going overboard and the recipe isn’t that great and other times it just packs a huge punch of flavor that turns out wonderfully. Fall spices like cinnamon, ground ginger, nutmeg, allspice and cardamom are all strong flavors. They can easily overpower a dish but when you get the right combination, it can really make a dish sing. Most people, reasonable people, would have chosen one or two of those spices and added them to cranberry sauce. But then there is me. Who decided to add ALL of them. Because, why not? A cranberry sauce made with tons of spices and apples creating the taste of “Christmas in your mouth” as said by some of my family members. 1. 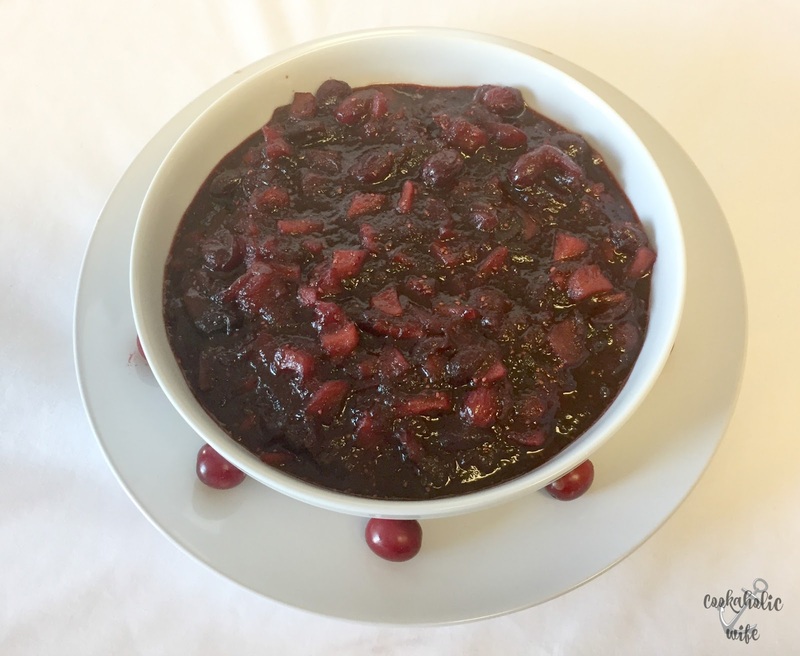 In a large saucepan or pot, combine cranberries and apples. 2. In a small bowl, combine cinnamon, ginger, cardamom, allspice, nutmeg and salt. Pour over the cranberry apple mixture. 3. Pour the apple cider and bourbon top and then add the brown sugar. Stir until mixed. 4. Heat over medium high heat, stirring frequently until the brown sugar bubbles up. Reduce the heat to medium low and continue stirring as it bubbles and the cranberries and apples break down, about 15 minutes. 5. Remove from the heat and use a potato masher to break down any of the cranberries that haven’t popped. The mixture will be syrupy but will not have thickened up yet. 6. If serving immediately, transfer to a dish and allow to sit for 15 minutes or until thickened. Cranberry sauce can be refrigerated for up to 1 week or frozen for up to 1 month. To serve from frozen, transfer to refrigerator 24 hours in advance, then allow to come to room temperature for 1-2 hours on the counter before serving. It turned out to be a genius decision. I thought the cranberry sauce was pretty good when I tasted it before packing it away into a container to freeze until the day before Thanksgiving. But the comments I got about the cranberry sauce made me realize it was a new hit and how happy I was that I remembered to loosely measure and write down the ingredients so I could make it again. I was told more than once that the dish was a winner and that it tasted like “Christmas in my mouth”. 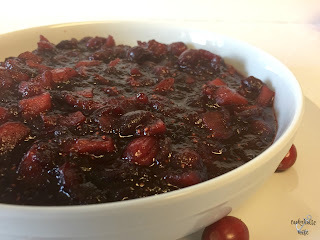 Now I know cranberry sauce is typically served on Thanksgiving, but that comment got me thinking and then I decided that we’re going to have this cranberry sauce again, as a glaze on top of a ham for Christmas because the flavors already fit right on in!